WASHINGTON—God created music, dammit. I’m convinced. 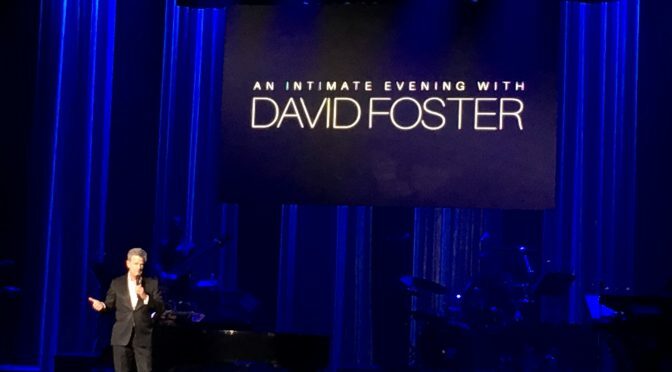 And he, she…or he and she…or it or them-there… they put a bunch of it on display last night when David Foster’s Hitman Tour hit D.C.’s Warner Theater. David Foster is not, as James Comey might say, “out breaking legs and– you know, shaking down shopkeepers.” Nothing like that. This Hitman slays our hearts by taking shaped notes and cranking out hit after hit over decades—so many that you might not know how much this man’s musical footprint has pitter-pattered over your life’s soundtrack. An intimate feel it had with the Warner Theater’s ornate architecture and cozy seating. Foster accompanied all of us down memory lane with with a team of fantabulous singers. They were EXCELLENT. “I wish I could sing like that,” Foster joked during the set, “then I wouldn’t need them.” He did croon lines from some of his beloved hits as well. And he’s needed, because no one can write what he writes how he writes it. LAWDY-BE it was a good show! I just hope the adorable 70-something year old blonde lady sitting next to me didn’t think I was too loud when I got all happy and started shouting “YAAAAASSSSS” like I was up in church or something. She didn’t complain. Sooooo… I’m a little biased about which of Foster’s guests I enjoyed most. Don’t get me wrong—I enjoyed them ALL. Fernando Varela and Pia Toscano can sing like NOBODY’s business! Whew! But Shelea blew the roof off the motha-sucka! “I don’t understand why someone like her doesn’t have a show in her own right. She’s good,” CIA seat-neighbor told me. The Hitman tour isn’t over. There are still some dates coming up in Florida. If you’re nearby—or not—airplanes still work, lol! And if you can’t make it, just Google samples of Varela, Toscano, and Shelea. If you ever see them live—methinks it’ll be worth it.